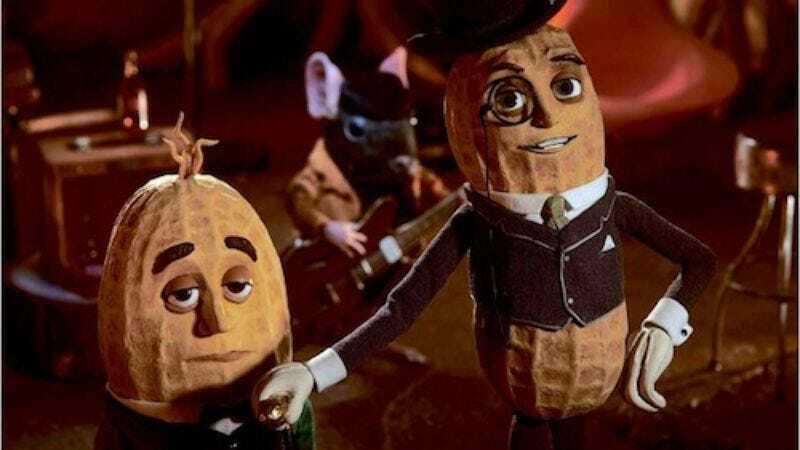 Sensing a precipitous drop-off in peanut awareness, Planters has sunk an estimated $35 million into reviving its Mr. Peanut mascot, giving him a retro-cool makeover and hiring Robert Downey Jr. to give him voice for the first time—because while people like Mr. Peanut, they don’t feel like they know Mr. Peanut, and allowing him to speak will, as a Planters rep says, mean that “people can engage with him more.” And who is more engaging, more imbued with a voice like a warm handshake than Robert Downey Jr.? Of course, engaging or not, Mr. Peanut still comes off as slightly better than you, as the same rep cautions, “He’s still Mr. Peanut, with the top hat and monocle and cane.” It’s just that his projected image as an idle rich dandy—the Eustace Tilley of legumes, if you will—now has some context, with the ad campaign (debuting tonight on Facebook and all over your TV shortly thereafter) depicting Mr. Peanut’s high society world of grand dinner parties thrown for friends like "a mole, turtle, butterfly, and grasshopper." Which seems like an odd group of consorts for anthropomorphic nuts, but whatever. Judge a peanut by the content of his character, not by the company he keeps, we suppose. Perhaps once we’re allowed to engage with Mr. Peanut, we’ll learn why he prefers to commingle with creatures that would probably just as soon eat him instead of his fellow snacks. You know, maybe it’s a self-loathing, Jay Gatsby sort of thing. Anyway, Mr. Peanut is also now a natural peanut-brown instead of that cartoonish yellow, and his peanut nakedness—which, with just a cane, monocle, and hat, has long suggested some sort of bizarre, salty sexual role play—is now tastefully accompanied by a gray flannel suit, in keeping with this season’s trend of heritage brands. Also, he’s kind of ambiguously gay now: Mr. Peanut has a new, ever-present male companion named Benson who’s “quite enamored of Mr. Peanut,” prompting the advertisers to clarify that they’re “just friends” and “Benson does not live in Mr. Peanut’s house.” Indeed, because that would be unsavory. Get it? "Unsavory"? It’s kind of a slow news day, obviously.